Earn up to 14,392 reward points. Refreshed Apollo with FireWire connectivity. Apollo FireWire is one of the world's most popular professional audio interfaces delivering the sound, feel, and flow of analog recording to music creators everywhere. A perfect centerpiece for studios running original Mac Pro towers and Windows 7 machines, this 18 x 24 FireWire 800-equipped interface features analog design based on UA's 50-year heritage, along with gold-standard Apollo A/D and D/A conversion for impeccable audio resolution. Apollo FireWire further distinguishes itself with Realtime UAD-2 Processing and Unison technology, letting you record with near-zero latency through the full range of UAD plug-ins from Neve, Studer, Manley, Lexicon, and more ” including new mic preamp emulations from Neve, API and Universal Audio. With its elegant workflow and world-class audio quality, Apollo FireWire is the perfect interface for music producers seeking classic analog sound. Designed to play a central role in studios running original Mac Pro towers or Windows 7 machines, Apollo FireWire delivers an uncompromising approach to audio quality. Building upon decades of UA hardware heritage, it offers extremely high-resolution sound, with the lowest THD and highest dynamic range in its class. 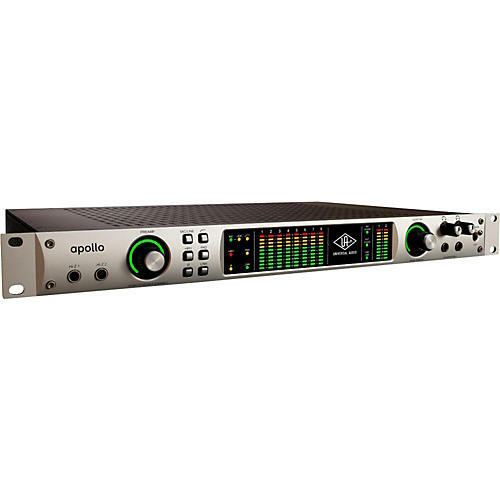 Apollo FireWire's four premium mic preamps and converters translates into recordings with astounding accuracy and depth ” whether you'e tracking and overdubbing, or mixing and mastering. The Apollo FireWire's bundled œRealtime Analog Classics Plus suite of UAD plug-ins gives you the UA 610-B Tube Preamp & EQ, Raw Distortion, Softube Amp Rooms, legacy LA-2A, 1176, and Fairchild compressors, Pultec EQs, and more, so you have a rack full of bonafide audio classics, right out of the box. Better still, Apollo FireWire's UAD plug-ins are also available during mixing and mastering, so you can use UAD plug-ins (VST, RTAS, AU, AAX 64) throughout the creative process. A Universal Audio breakthrough, Apollo FireWire's Unison technology gives you the tone of the world's most sought-after tube and solid state mic preamps ” including their all-important impedance, gain stage œsweet spots, and component-level circuit behaviors. Based on unprecedented hardware-software integration between Apollo's mic preamps and its onboard UAD plug-in processing, Unison lets you record through stunning emulations like the bundled UA 610-B Tube Preamp plug-in, or exclusive preamp emulations from API and Neve. One key feature of Apollo FireWire isn't really a œfeature at all. It's the numerous design details that give you a fast, natural workflow ” and better results. There are physical front-panel controls for all the most commonly used features, including Preamp and Monitor level knobs, channel selection, mic pad and low cut, phantom power, and dual headphone outs with independent level control. Smart Hi-Z inputs on the front panel detect when you've connected your guitar or bass. Sonically, Apollo's Monitor outputs are digitally controlled analog, so you don't lose audio resolution when you adjust gain. * All trademarks are recognized as property of their respective owners. Individual UAD Powered Plug-Ins sold separately. High-performance with realtime UAD processing, order an Apollo series interface today!